Not all drones are used for evil intent. This one shoots video. A couple of wetland enthusiasts, Matt and Nathan, came to our district recently to shoot some footage and do a couple of landholder interviews for their upcoming video – ‘Farm Dam Blitz – making wildlife welcome’. We were happy to show them around two local wetlands that are having a makeover: Vin’s irrigation dam at Swanpool and Ken’s farm dam at Warrenbayne. Over the last six months or so, the two dams have been getting quite a bit of attention: fencing, tree planting, island building, logs in the water etc, and Matt was keen to see the results. First we met with Vin for a tour of his new wetland. Nathan with remote, preparing for take-off. Fencing excludes stock from the wetland edge. Taking HD aerial views using a camera slung below the drone. A new corridor of plantings along the creek connects the dam to roadside vegetation. Logs, wetland plants, uneven ground surface and fencing will provide good habitat. And two new islands as well. Matt interviewing Vin about his wetland project. Woodland plantings around the dam. A gate in the fence allows access for maintenance. Timber debris and shallow scrapes are great habitat for all manner of invertebrates, as well as frogs. Rushes along the water’s edge will soon have the company of a diverse array of shrubs and trees. Next stop was Ken’s much smaller farm dam, where flying conditions were perfect. The drone can stay aloft for 15-20 mins and has a range of 500 m, or so. Nathan says his biggest challenge is the wind, which can make flying the drone precarious and difficult to get good video. But that wasn’t a problem this day. Matt admiring some of Ken’s new wetland planting. The dam has extensive reed-beds in the shallows – now protected from hungry mouths. Several old River Redgums bookend the dam and provide valuable habitat. Touch-down for the last time today. With the interview over, Matt, Ken and Nathan (& the dog) do me the favour of posing for the camera. Thanks to Matt and Nathan for their interest in our little project it – was great to share our experiences with them. And special thanks to Vin and Ken for the efforts they’ve made with their wetlands and being generous with their time. 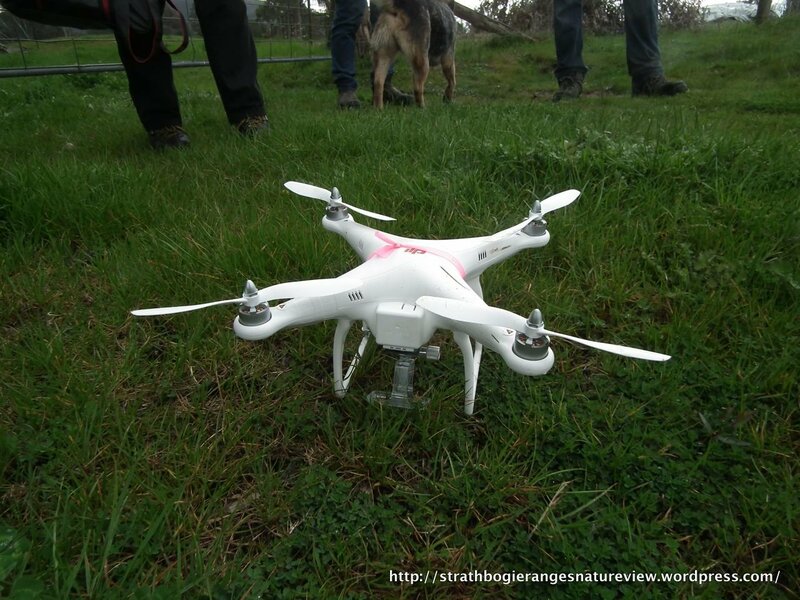 You can read more about our local Farm Wetlands for Woodlands project, or see some pics of the other project sites on the Strathbogie Ranges CMN website and blog. A link to Matt and Nathan’s video will be available here soon. Next Next post: Information on local aboriginal plant foods .